It’s been a year since upstart photo app EyeEm launched. A year in which Instagram rocketed in usage and was bought for a billion bucks by Facebook. A year in which other startups like Color, Lightbox and Picplz dropped from view, though it also has local Berlin competition in the form of Tadaa. So in that context, what’s it like still plugging away at the photo app game? What can EyeEm still offer in the face of such competition that’s so different? We caught up with co-founder EyeEm Florian Meissner at his Berlin base to pose a few questions. EyeEm says its key differentiator is the ‘discovery element’ of the platform. The problem is, plenty of others do this. PopSet, for instance, has appeared offering location based photo grouping for instance. Is ‘discovery’ enough of a feature to keep people interested and coming back? To be honest, no one else does it. The way we discover content through our friends is broken and we need to find novel ways to help people find things they will be interested in. We believe our discovery model is unique, both from a technical and a community perspective and our ambition has always been to be the first to perfectly organise and structure all photos taken with EyeEm (and eventually all photos from the social web) and leverage the data cube behind it to build the most personalised experience out there. EyeEm avoided a too-social app and instead monitored its users’ tastes and recommended content. What data have you discovered from this approach? Actually, one of our main goals is to bring social to the next level by connecting people beyond their existing social connections through the photos they take. Imagine your favorite bar or your new hobby has a little sub community all of its own filled with like-minded people, and with every photo you take we get to know you a little better. Are you a foodie? What conferences or concerts are you attending? Where are your favorite places? By combining this data we can build a pretty accurate taste profile that helps us create a magical discovery experience for you. Could you unpack your definition of a Data Cube? Every photo that’s uploaded to EyeEm has a lot of valuable contextual information attached. Instead of asking users to manually enter that information (via hashtags, among other things), EyeEm deduces it based on their location, time, activities and various other specificities of the photo. By adding that contextual layer on top of each photo, they are able to build a multi-dimensional cube of information that we can then traverse (what we like to call slice and dice) in a variety of ways to search for and recommend photos. Starting with all available photos, we can slice into photos of my city, filter those on the time of day, and drill down to the hobbies I’m into at the moment, and what my friends are doing right now. By automating those filters, discovering content becomes effortless. Can you win over new users that way? Our philosophy has always been to attract users as organically as possible. We’ve yet to do any paid-for social media marketing, and it’s one of the main reasons we enjoy high engagement levels amongst our community; people who are on board with us want to be here purely of their own volition. Can you lure people away from Instagram and others? Most definitely. We believe that our model offers something that is currently unavailable on other platforms, including Instagram. We saw interactions and engagement levels triple in the wake of Instagram’s sale to Facebook earlier in the year. Furthermore, the aspect of filtering and sharing a photo is now practically built-in to most mobile devices. People may use Instagram to see what everyone they know is doing, but they will discover what’s cool and relevant on EyeEm. You can have a great experience on EyeEm without having any followers. What other service can claim that? What do you think are Instagram’s weaknesses? It’s a very well rounded product that does everything it promises, quickly and with no fuss. But offering a couple of fun filters and free sharing options to other social platform is not a key differentiator these days. The big question is how they will start surfacing relevant content as opposed to the usual social photos that we see on Facebook anyway. Instagram nailed photo sharing, but it’s doubtful that they can afford to shock their users by shifting focus towards discovery. The problem there is social noise… photos of breaking news are in the same feed as food, cats, and everything else. Moreover we are a strong believers in a cross platform experience giving our users the opportunity to share their moments with all their peers. Your European competitor Mobypicture has over 1m users right now. What are your user numbers now? On our current growth pattern, we will hit our first million users by October. Considering we have been up and running for a year now, we’re on the right path and given how other services who ran head long into the open graph and are now suffering cuts and retractions, we are excited about the upcoming months. A million users by October is not amazing – is that going to be enough to keep your investors happy? Our strategy and approach to date has been fully supported by our investors. We have a very robust game plan in the upcoming months, which we’re all excited and confident about. You run on-the-ground EyeEm meet-ups in various cities targeting power users. This strategy has taken a lot longer than rival apps. But that has *prevented* you scaling faster. EyeEm is by no means on 30 million users as Instagram reached. Isn’t it ‘game over’ for these kinds of apps? A lot of services in the space experienced temporary massive growth by abusing Facebook’s Open Graph, however, those growth spurts were short-lived and followed by huge churn in MAUs and DAUs. We decided to implement a more relevant and solid FB integration, and see this as a longterm investment in user quality, satisfaction and engagement. No doubt the last year has been tough for photography apps, with the likes of Color, Lightbox and Picplz dropping off. But we’re still here, and growing! EyeEm’s user interface is admittedly one of the best out there and it could be argued that it lets the app stand out from rival apps. The question is, is that enough to keep users engaged? It’s something we are constantly reviewing and amending, both through user feedback and our own data driven learnings. We do consider it one of our strengths, partly from having a great internal design team, but to suggest design alone is enough to keep users engaged is missing the point. Speed of execution, our community outreach and offering relevant content are what we feel will keep our existing users engaged, and that is where we will continue to push long term. EyeEm has exploited the obvious routes to engagement and signups through Facebook integration. But a lot of the traction must have been wrenched from iPhone and Android by now. 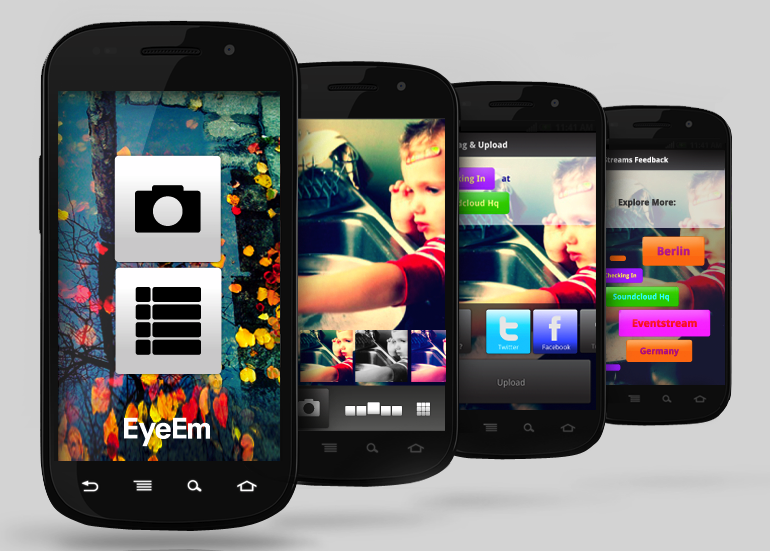 Is the WinPhone version EyeEm’s last throw of the dice? Back when we launched the WinPhone version we restated that all along our aim has been to, “make photography accessible to anyone, anywhere, no matter what device they are using.” That’s still as true now as it was then; getting on to any platforms we feel are relevant for our technology. We also relaunched our web platform, to bring it inline with the design and functionality of the mobile apps. Moreover we have big plans to make our unique data structure even more available to third party developers through our API. A great opportunity to showcase that will be our next http://photohackday.com/ that we are hosting in partnership with Facebook and Getty images at the end of September in Berlin. You’ve raised an undisclosed amount of seed funding from Passion Capital, Wellington Partners and well known Berlin angel investor Christophe Maire, rumoured to be around the $1 million mark. How much runway do you have left? We’re lucky to work with some of the best investors a Berlin startup could hope for. Christophe is our Exec. Chairman, and he has been a constant source of advice and support. Daniel Waterhouse and Stefan Glänzer alongside their funds are adding enormous experience. We have enough in the tank to take us well into the new year, with ongoing discussions with our existing backers and potential new partners to secure our future beyond that. What, in your opinion, has Facebook done wrong on photos? Apart from lack of filters? I wouldn’t go so far as to suggest that Facebook has done anything ‘wrong’ with photos, perhaps only that they have stood still where they could have innovated further in the photo sharing space. Same thing for Flickr, Google and even Twitter. They have been happy for the likes of EyeEm to offer alternative methods of getting images onto the platform, and you feel that with their added emphasis on mobile as a platform going forward they will revisit this. The Facebook Camera app is perfectly functional, but I feel they will look to extend its possibilities in the near future. So what’s next for EyeEm? We have literally just started to unfold the power of our data cube. We will continue to work on creating the best personalized experience out there, our data cube also plays a big role in our exploration of routes to monetization. Exciting times ahead.